Comm Eye Health Vol. 19 No. 59 2006 pp 48 - 49. Published online 01 September 2006. President of Centre for Research and Education (CREED). Editor, Journal of Creative Communications, C 6 and 7 Meera Apts, Bashirbagh, Hyderabad 500 029,India. Research scholar, ICFAI Institute for Management Teachers, 3rd floor, Astral Heights, Road no. 1, Banjara Hills, Hyderabad 500 034,India. Country Director, ORBIS India, C-10, Gulmohar Park, New Delhi 110 049,India. Senior programme manager, ORBIS India Country Office, C-10, Gulmohar Park, New Delhi 110 049, India. 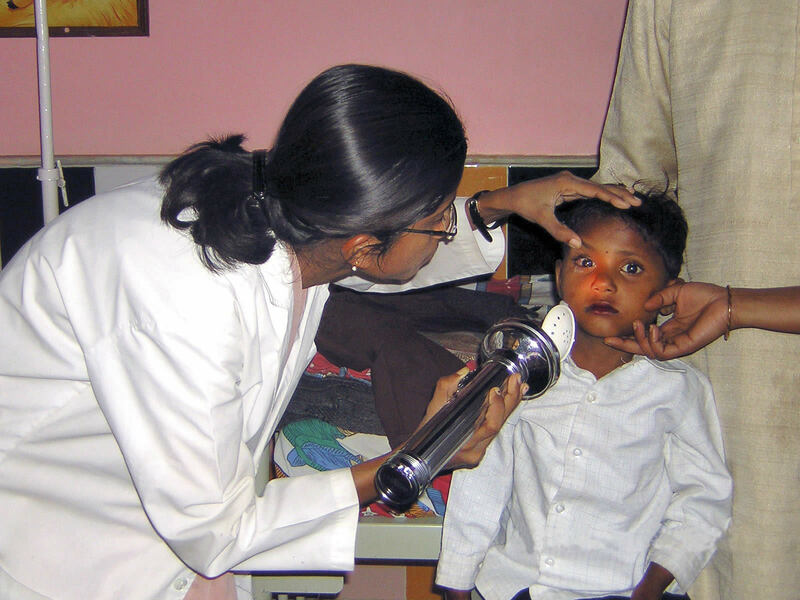 Childhood cataract, congenital and traumatic, is the most common treatable cause of childhood blindness, being responsible for 10 to 30 per cent of all childhood blindness. Preventing blindness from childhood cataract requires not only high-quality paediatric surgery, but also an awareness of parents’ understanding of the eye problem, and why they might not agree to surgery for their child. Several studies have examined the medical and social aspects of childhood cataract. Foster et al.1 point out that childhood blindness has huge socio-economic costs, and restoring the sight of one child blind from cataract is considered equivalent to restoring the sight of 10 elderly adults. It is therefore crucial that we understand why parents might not take up the option of surgery. This study was conducted with three objectives. The first objective was to explore the layperson’s interpretation of cataract-related blindness. Essentially, we wanted to find out what the parents of children with cataract feel about their child’s eye problem. The second objective was to examine parents’ beliefs about paediatric cataract. These beliefs play an important role in explaining health-seeking behaviour. Two specific belief-related questions were cross-tabulated with doctors’ recommendations for surgery. The third objective was to determine barriers to paediatric eye care at the institutional level. A 22-item scale of barriers to paediatric eye care was developed, pre-tested, and included in the questionnaire. The questionnaire was administered to 1,070 parents who visited six ORBIS-supported eye hospitals for their children’s treatment (Table 1). Of these children, 106 were diagnosed as cataract patients (including congenital, developmental and traumatic cataracts). This study analyses the responses of the 106 parents using qualitative and quantitative techniques. The narrative of colour. In this narrative, parents describe the eye problem in terms of the colour of the eye: whiteness of eye, white spot, white film, pale white spot, etc. The change in the colour of the eye from black to white is perceived as a shift from ‘normal’ to ‘abnormal’ and produces anxiety and fear among them. It is as much the condition of the eye as the parent’s response to it that brings the child to the eye hospital. The narrative of cause. Here, parents describe the problem in terms of factors they believe cause cataract. The main cause for cataract was identified as ‘injury’ – injury to the eye due to throwing of palm tree leaves, penetration by pencil, friend’s fingers, or foreign body, and fire cracker injury. The narratives of such parents tend to be constructed around a specific event and the cause of cataract is attributed to invasion by an external agency. The narrative of consequence. Finally, parents describe the problem in terms of effect it has on the child. Phrases such as not seeing properly, lack of visibility, vision problem, unable to see black board, swelling, watering, rubbing, itching, irritation and redness of eye were commonly used to describe cataract. The first four descriptors refer to the relative absence of faculty or ability (vision) and the rest denote observable changes in appearance of the eye. Lack or loss of vision, and appearance of the eye, are both reasons for parental concern. This study also examined parents’ beliefs about eye surgery, especially with regard to those paediatric cataract patients who are advised to have surgery. We suggest that beliefs are an important cultural determinant of treatment-seeking behaviour. Two belief statements “the child is young for surgery” and “the child’s eye is better without surgery”, were cross-tabulated with the time when the doctor advised surgery for the child (during this visit/earlier visit). Sixty-one out of 106 cataract patients were advised to have surgery. Tables 2 and 3 show the results of the cross-tabulation. According to Yorston,3 surgery may be delayed for years in adults without affecting the visual outcome. In infants, however, if the congenital cataract is not removed during the first year of life, the vision will never be fully regained after surgery. Table 2 shows that the majority of parents (35) believe the child to be too young for surgery. This implies that parents appear to associate a ‘sophisticated’ medical intervention (such as surgery) with more advanced age. Specifically, the parents appear to believe that surgery is for adults. But when does the child become an adult and ready for surgery? The data included three age categories: under six years (37 per cent), between six and eleven years (33 per cent) and above eleven years (31 per cent). The 35 respondents who agree with the belief that the child is too young have children spread across the three age categories. This finding is significant because it suggests that the child’s readiness for surgery is determined neither by the condition of the eye nor by his/her biological age, but is culturally determined. We conclude that a child’s readiness for surgery is a complex decision for the parents and that their decision may be influenced by the gender of the child, the number of children in the family, prior knowledge of eye surgery, and social and peer influence. Table 3 shows over one-third of parents agreeing with the belief statement that the eye will get better without surgery. This group of parents, one would imagine, would be hard to persuade. Whereas the parents in Table 2 could be persuaded through education, those in this group would require prolonged engagement and demonstration to change their beliefs. The main purpose of this study was to determine the barriers preventing parents from accessing eye care facilities at hospitals. The survey questionnaire designed for this purpose included a 22-item scale that measured the respondent’s extent of agreement with each item on a 5-point Likert scale (1=complete disagreement, 5=complete agreement). The barrier scale was factor-analysed using the social sciences statistical package, SPSS 13.0. In simple terms, the factor analysis shows that parents confront three major barriers. In order of importance, these are: access to services, economic difficulties, and beliefs. This study shows that parents fall back on the known and familiar in making sense of cataract. Their discourse about cataract is interspersed with references to notions of colour, cause, and consequence. Cultural beliefs about the ‘appropriate’ age for surgery and the eye getting better without medical intervention appear to influence access to hospital-based services. It is very likely that the perceived severity of the cataract, and the likely impact it may have, motivates parents to seek hospital-based treatment. Policy makers should design communication interventions to address age-old beliefs. Primary health workers, NGO volunteers, and general physicians should be trained to detect paediatric cataract cases, empathise with the beliefs and fears of parents concerning the problem, and motivate them to visit an appropriate paediatric eye care facility without delay. This study also shows that access to eye care facilities and the cost of treatment are two of the three major barriers to paediatric cataract treatment. Innovative schemes should be designed to address these barriers. Subsidising services and providing travel expenses, or providing patient transportation facilities, may increase uptake of services. Paediatric eye care should aim to provide not only quality clinical care, but also quality interpersonal communication which allows parents of children with cataract to express their views and feelings about the problem. The larger issues of poverty and education need more attention than they are currently receiving. However, a word of caution would be appropriate here: the findings of this study are related to hospital-based paediatric patients and things could be very different in the outreach setting. The authors thank the programme managers at six ORBIS-supported eye hospitals who provided support towards completion of the study. 1 Foster A, Gilbert C, Rahi J. Epidemiology of cataract in childhood: a global perspective. J Cataract Refract Surg 1997;23: 601-4. 2 Helman, C. Culture, health and illness. 1984. Oxford: Butterworth-Heinemann. 3 Yorston D. Surgery for Congenital Cataract. J Comm Eye Health 2004;17(50): 23-25.